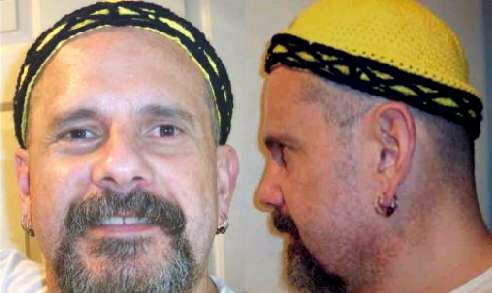 I was inspired by David, another fellow crochetter, blogging @ http://www.david34.blogspot.com and his Nike Skull Cap. I dediced to make one with the same colors. It actually goes with an Old Navy T-Shirt I have and some shorts with matching colors. The pattern is made in single crochet all around, done with Lion Brand Kitchen Cotton Sunflower Yellow and Bernart Berella "4" Navy Blue. I was trying to give you the impression of a 3D lattice with diamonds around the cap. The lattice has some overlaid single crochet stitches and some chain ones and maybe four double crochets. It is a unique pattern, I never make two patterns alike. The only time my skull caps are alikel is when they are made in a plain single crochet stitch. Did you notice that there are some vertical lines, four in total, One in front aligned with your nose, one on back and the other two in front of each respective ear. I think it is a very nice hat . What is the best attribute this skull cap has? It breathes, because it is 100 % cotton. The amount of man made material is insignificant to detract from the benefits of cotton. Thanks for stopping by, I have a Vest that I am almost done making , maybe by next Tuesday or Wednesday I will be able to model it for you. I am also working on Dachshund Heidi and she is coming along nicely. Until later this weekend. Happy Halloween!!! Boo!!! The skull cap looks good. I think you did a great job with Drew's vest pattern.